Make sure that this doesn't happen. While they are certainly not as skilled at killing birds as cats are, some dogs derive great pleasure from chasing them. Because dogs are carnivores, the ultimate aim is to catch and kill the bird, and occasionally your dog might get lucky, especially with poultry, water birds or newly fledged wild birds. 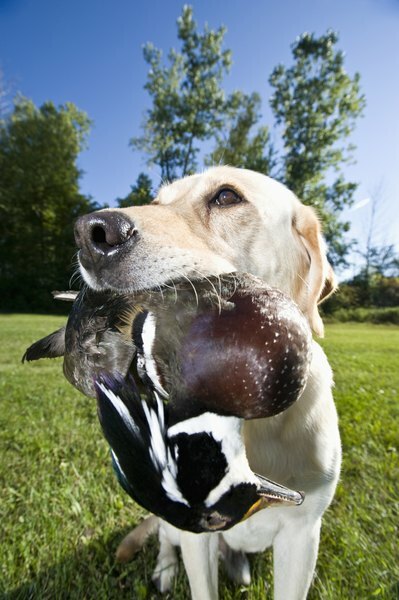 Start bird training as soon as possible, preferably while your dog is still a puppy. A dog of any age can be trained, but it's easier when he's young. Take your dog to a place with large numbers of wild birds. In an urban area the best option is a pigeon-filled park. In rural areas, try fields where crows or other common birds are feeding. Keep your dog on a short leash and as soon as he shows interest in a bird, distract him and walk rapidly in the opposite direction. Once the bird is out of sight, pet your dog and/or provide a treat. Continue this training at least three times a week, but preferably during every, or every other, walk until he appears to be showing little interest in the birds. Clip a long line or tie a rope to his collar and allow him to walk freely near birds with the line trailing behind. If he makes a move to chase one or shows any interest at all, grab the end of the line but do not pull. Instead call his name and walk away from the bird. The line is meant as a safety measure, in case he doesn’t respond to your voice. In that case, pull gently. Spend time training your dog to come when called, both before and alongside bird training. The stronger his response to your call or whistle, the easier the bird training will be and the more chance you have of him abandoning a chase. A dog whistle, which produces a high pitched sound inaudible to most humans, helps because it is a sound a dog can hear very clearly. It is also one he is only likely to hear when you call him, (unlikely human voices, which he’ll hear all the time) so he should respond immediately. Keep your dog on a leash around birds if he doesn’t respond to training. This is especially important when ground-nesting birds are breeding, when newly fledged birds appear, around water birds (some of which can’t take flight very quickly) and anywhere with free-range poultry. Beaches, for example, often have large numbers of ground-breeding birds, some of which are endangered. Your dog could do a great deal of damage to the nests and chicks. If in doubt, keep his leash on. Book a series of classes with a professional dog trainer, preferably one who has extensive experience training dogs to behave around wild animals. If you are inexperienced at training dogs, or your dog is a determined birder, this should help. Fetch games form an excellent outlet for a dog’s natural urge to chase and catch, and they're also good exercise for him while requiring little exertion from you. Invest in a few balls and a Frisbee and make playing part of your dog’s routine. If you have a friend with pet birds, such as parrots or pigeons, spend a few training sessions near them. In this case, make sure the birds are securely locked in their cage, at least until you think your dog is thoroughly trained. The Australian RSPCA recommends spending gradually increasing periods near the birds, with an increasing distance between you and your dog, making sure that your dog’s entire attention is focused on you. Of course, never leave your dog alone with the birds, especially if they are out of the cage. The effect of this training is to make it much less likely that your dog will be distracted by birds when you are outside. Don’t let your dog chase any birds. You might think it funny to watch a dog chasing pigeons, which he has little chance of catching and are not exactly endangered. However, your dog is unlikely to make a distinction between pigeons, critically endangered wild birds and free-range poultry. Nip all bird-chasing behavior in the bud. Never punish your dog for chasing birds or other animals. It is not fair -- chasing is a natural instinct and some breeds were bred for this very purpose -- and it will only make him anxious. What Music Should I Put on for a Parakeet?